Attention carnivorous plant fans: did you know that you can see three different Pitcher Plant genera on display at the Garden? 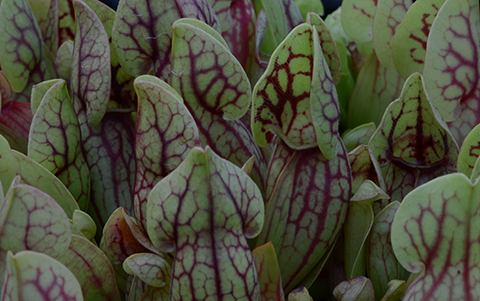 You may have seen our native Sarracenia in the large bog on the south side of the Fuqua Orchid Center. The Nepenthes occupy their own corner of the Conservatory's Special Exhibits gazebo. 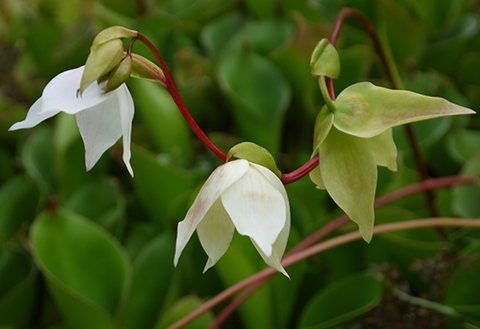 In order to see the rarest of the Pitcher Plants, the Sun Pitchers (Heliamphora) you will need to make a trek to the Tropical High Elevation House. Of the three Pitcher Plant genera native to the Americas, the Sun Pitchers (Heliamphora) are perhaps the strangest. 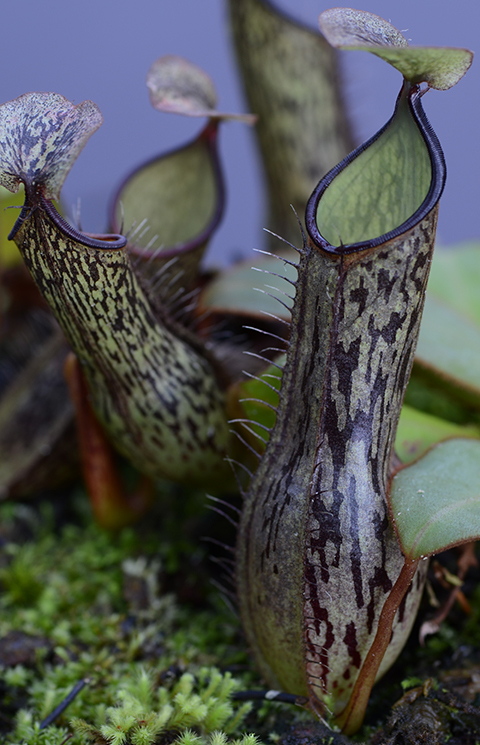 In addition to the ususal trapping epuipment (digestive glands, downward-pointing hairs), each pitcher is surmounted by an alien-looking spoon-shaped structure--a sweet and sticky lure for insects. In nature the Sun Pitchers grow only on the tabletop mountains, or tepui of the Guayana Highlands of southern Venezuela, Guayana and northern Brazil. The tepui rise 5,000 to 10,000 above the surrounding savanah. One of the largest, Auyan-Tepui, has an area of 286 sq. miles. Angel Waterfalls, the tallest waterfall in the world tumbles 3,300 ft. down the sheer face of Auyan-Tepui. Tepui are isolated from each other by deep valleys and thus creating islands of vegetation, each with its own flora. Weathering and erosion have carved weird formations into the sandstone and created an other-worldy landscape with many unique micro habitats. Cold temperatures, strong winds, mists, high rainfall and intense sunlight are typical. The tepuis are remote; the tops are accessible by helicopter, so very few people have seen Heliamphora growing in their native habitat. You can see our plants, no helicopter required, on permanent display in the Tropical High Elevation House.